Editor’s Note: This is a collaboration in which a Jew and a Gentile write about prejudice and antisemitism in New Orleans and beyond. I am not Jewish, not by heritage and not by faith. That doesn’t mean that I can’t see what’s happening around me in both the city of New Orleans that I’ve called home for eleven years and the country at large. Hate crimes against the Jewish population are on the rise, significantly. According to the FBI (via CBS News), nationally, hate crimes were up 17 percent in 2017 compared to 2016. Furthermore, over 58 percent of the hate crimes that were motivated by religion in 2017 were directed at Jewish peoples. This is a significant increase from 2016 where that number was closer to 52 percent. Until a few weeks ago I hadn’t had much direct experience with the effects of this beyond what I’d seen in the news. The focus of the service was gratitude, not just towards G-d but also towards every small aspect of one’s life and surroundings. The beauty of this message and the welcoming atmosphere in the face of such recent, violent hatred from a right-wing extremist was extremely humbling. Even though many Jewish people have done much to contribute to American society, the irrational hatred and conspiracy theories that plague the Jewish people persist from White Supremacist, “America First” groups. From the Klan to more recent far-right fringe and Neo-Nazi groups (read: Richard Spencer’s ilk), this irrational hatred and conspiracies, persist and spread. This is immensely ironic considering that there is no modern United States without the contributions of the Jewish peoples. From the fields of medicine, science, law, business and more, Jewish contributions to our society are all around us. Levi Strauss invented Levi Jeans. Jonas Salk invented/discovered the polio vaccine. These are just two well known of many examples. The impact of the national rise in hate crimes against Jewish people over the past few years is clear. The impact on Jewish communities is clear also. Of course, the presence of armed guards at some synagogues and the rational fear of bodily harm that precedes such a need is a clear result of what is happening nationally, but it is also a direct reflection of what has been happening locally. Examples range from graffiti to bomb threats amongst other things. For instance, in September of 2018 (during the time leading up to the mid-term elections), there was graffiti put on a synagogue in Mandeville in order to incite terror within the Jewish population of Louisiana. 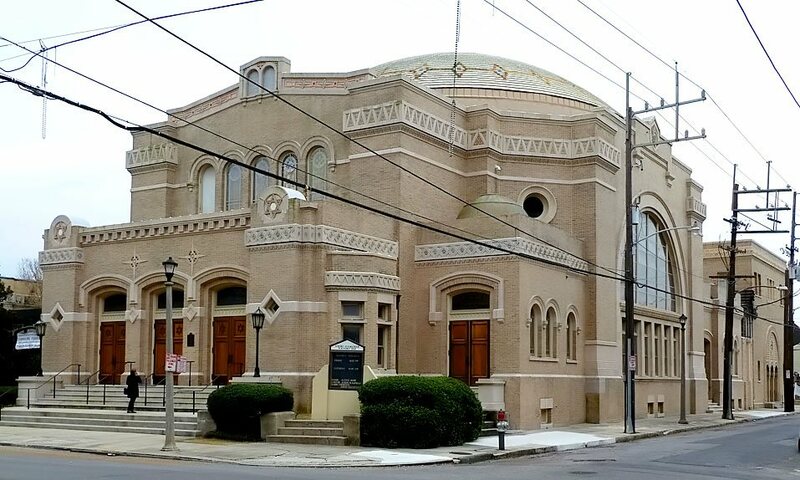 According to the Associated Press, the words that were left upon the synagogue contained “Synagogue of Satan,” as well as “numbers that were part of white supremacist code.” Graffiti may seem like a small matter, but the fear and anxiety that it can incite in a historically globally disenfranchised population is no small matter. More pressing and terrorizing than anti-Semitic Graffiti on houses of worship is the all too common bomb threats that the Jewish community faces, including in New Orleans. For one example, in late February of 2017, a bomb threat caused the evacuation of the New Orleans Jewish Community Center. According to WWL, the bomb threat was called in at 9:15 AM and the NOPD investigated before allowing people to return into the center. Even though the threat was fake, the terror and anxiety that is created within an entire community through this kind of act of hate remains and is built upon by each further hate-crime. We have work to do in Louisiana. Those of us who are not Jewish must stand against the rising tide of Anti-Semitic hate in our state. Even in our blue bubble of New Orleans, there is much work to do. It is not enough to be non-prejudiced, in this national and local climate of rising hatred we must be actively anti-prejudice. The Tree of Life Pittsburgh shooting on October 27 was an ugly shock. Growing up in Brooklyn, going to college in a hippie corner of New England, I had never considered anti-Semites a deadly threat. I read the names, as a modern person does, and I learned that one of the victims was Rose Mallinger, a 97-year-old woman. My grandmother’s age. Like my grandmother, Mallinger went to temple. According to various tribute pieces that have been written about her, Mallinger was active and gregarious, and the synagogue was the center of her social life. This too, describes my grandmother, who currently lives alone and volunteers at a nursing home once a week. When Trump began to gain ground in the Republican primary, my grandmother was disgusted. “He reminds me of Hitler,” she told me once. Hitler had put most of her extended family to death. She left the Third Reich in 1934 when she was 13, and the rise of fascism and the Nazi party occurred around her in Bavaria. “The way he promises people everything… how can they believe him?” she asked rhetorically. It was early in 2016. In Trump’s incendiary, racist rhetoric, in his denigration of the disabled and of the “other”, I saw what she meant. When Trump was elected president, I cried. And I thought of how my grandmother, who had escaped Hitler, would have to live under Trump’s rule—when she loathed him so, and feared what he represented. Some, such as historian Jeffrey Herf have argued that Trump, despite his blatant racism and prejudice towards Muslims, Latinx people and African Americans, is not personally anti-Semitic. He has Jewish family members! (Dubious logic, despite however much he may love his favorite daughter). Rather, Herf argues that his public denigration of “elites” and embrace of various conspiracy theories naturally leads back to anti-Semitism. After all, many people think we run the world. In some ways, it’s a flattering assumption. Jews may seem to be over-represented in the media, and in the upper and middle class for many reasons. Most Jews in the world live in Europe, Israel and the US, “developed” countries with more wealth and higher levels of education—and Jewish people, according to a 2016 Pew Research study, are the highest-educated religious group in the world. The media industries in the US are clustered in New York and California, where many Jews in the US live. The Jewish faith holds literacy dear, and encourages critical thinking, even questioning faith—this is outlined in the Talmud, a sacred text that is basically a transcribed book club. Some have argued this is partially why Jews have the highest average education of all faith groups. Other theories point to the allure of intellectual, respected jobs (doctor, lawyer) as a vehicle for social status, while still other theories point to the Jewish community’s history in banking and lending as a profession that encouraged and privileged a certain form of learning and thinking—being “book smart”. Whatever the cause, modern antisemitism acknowledges this prominence and establishes within this framework an existence of a secret and evil cabal. Back in Bavaria, my grandmother attended school with Jews and Gentiles (her town had a somewhat sizable Jewish population). She had gentile friends in school when she was younger. I imagined she had seen them scratched onto benches and the walls of subway cars, where I had seen them before I left New York City. I made one into a diamond with a sharpie I had with me. Five days after the massacre in Pittsburgh, I learned that the synagogue that I went to preschool in had been vandalized, with threatening messages and swastikas scrawled over the walls. I had been there hundreds, if not thousands of times. I drank grape juice during Shabbat there as a child. I had realized I was an atheist there as a teen. I had chased my friends through those halls when I was five. It felt incredibly personal. Violating. Ilana Glazer of ‘Broad City’, who was to host an event there with journalist Amy Goodman, promptly canceled the event due to security concerns. My cousin texted me from Colorado, saying he was shocked at how much it upset him. I wanted to know more, I wanted to forget. But of course, I couldn’t—Amy Goodman was hoarsely interviewing people about it on my laptop while I ate my oatmeal. The man who allegedly wrote “kill all Jews” on the walls of Union Temple is also accused of attempting arson in another synagogue. He grew up in the foster care system, was homeless for some time, was diagnosed with bipolar disorder and may have struggled with addiction. It seems that he acted alone, but I have to wonder if the emboldened presence of anti-Semitism did not have a role in his actions. Hearing his story, and the fact that he had been committed to a psychiatric hospital under police custody, did not cheer me. Our mental health and justice system failed him, and will probably continue to do so. His story, if the allegations are true is a reminder that racism and extremism often find homes in the minds of social outcasts and the economic underclass. There is nothing to celebrate there. We are living in a moment where the US has all but closed its doors to refugees, where the government blatantly ignores the needs of trans people and even incites violence against them, where the police often kill civilians and have been given military-grade weaponry besides. At this moment, Jewish people can recognize the threat of fascism without claiming to be its sole targets. Whether or not rising anti-Semitism at home mirrors the downfall of the Weimar Republic, it is it is not valid to equate the rising visibility of antisemitism with systematic oppression. Most Jews in the US self-identify as white, and are perceived as white in general. We do not face the same oppression as people of color in the US, and we should not claim to. The majority of American Jews, those who have white privilege, have all of the ill-gotten gains that go with it. People of color, and particularly black men are far more likely than their white counterparts to be arrested, imprisoned, or killed by police. They are more likely to be convicted of murder during a trial and more likely to be sentenced to death. If American Jews want to work against racism and fascism, we need to work in concert with other anti-hate movements and respect the voices of frontline communities. We need to use our privilege as a weapon to defend human rights, whether that means positioning ourselves between targeted people and the police at protests, dismantling racism within our own communities, or donating time, money and effort to anti-racist organizing, among other things. My grandmother and grandfather, who were German holocaust refugees, were not allowed to seek asylum in the US. They were lucky enough to have relatives that sponsored their immigration. Far too many people were not so lucky. “I am a Jewish man, not a particularly religious one, and I am walking outside of the fence of a concentration camp for children. There is a connection there,” says Joshua Rubin, a software developer from Prospect Heights, New York. Rubin traveled to Tornillo, Texas, on the outskirts of Texas, to document the United States’ internment of child refugees. He has been camped there for two and a half months in an RV with no water or power hookups. For a long time, he was alone outside of the fence, though people from El Paso would visit and work to support his efforts. He is now joined by a coalition of activists from the St. Louis area, many of whom who participated in Black Lives Matter activism in Ferguson, Missouri. From when he arrived, the camp’s population tripled to almost 3,000 children and teens. Now, however, with the increased scrutiny, U.S. Department of Health and Human Services has announced the camp will close in a month’s time, and place children with other guardians. Rubin says he has seen a large tent dismantled, and has hope this may be true. And if we should learn from the past, then we should have neither the inclination nor the rationale to turn a blind eye to the injustices that plague our society today. Nolan Storey has lived in New Orleans for 10 years. He fell in love with this city as he received his bachelors in English from Loyola University New Orleans in 2012. Since then, he has gone on to publish three books, including two books of poetry. Thank you so much for this. In 2010 my novel Too Jewish was published for Kindle and was a bestseller for several years. Forgive this but the publisher said, “Jews read.” It was about Jewish self-hatred in New Orleans, though more complex than that. I’m glad the issues surrounding Jews in New Orleans are into the light here again. Thank you.